Being as it is a four-and-a-half hour German language silent film now approaching its centenary, it’s little surprise that appreciating - even watching - Dr. Mabuse, Der Spieler in the 21st Century can be very hard work at times. I would challenge even the most devoted cinephile, ardent lover of foreign film or pre-talkie zealot to proclaim this as easy viewing. The running time, taking up over a sixth of a day, is enough to require both a firmly steeled spirit and forward planning. There were certainly points where I thought Dr. Mabuse, Der Spieler had broken me, forcing me to declare it a film I just could not enjoy; ironically, the film’s colossal running time proved to be its saviour. The longer I spent in the company of Fritz Lang’s cinematic marathon, the more engrossed and enamoured with it I found myself becoming. Lang’s film is, almost literally, a story of two halves. 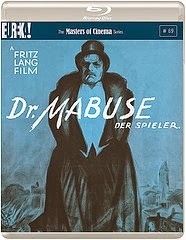 Dr. Mabuse, Der Spieler comes in two parts, each split into six acts signposted by intertitles. Part 1, entitled “Der große Spieler: Ein Bild der Zeit” (“The Great Gambler: An Image Of The Times”) comprises roughly the first two-and-a-half hours; part 2, “Inferno: Ein Spiel von Menschen unserer Zeit” (“Inferno: A Game For The People Of Our Age"), provides the concluding two hours. Whilst clearly the opening and closing parts of the same story (as opposed to a film and its sequel, for example), it’s worth noting that the two sections were in fact screened separately at the time of the film’s release, often on consecutive days. Cynics might take this as evidence that, even in the 1920s, picture houses knew how to make as much money as they could out of the films they showed. Personally, I’d take it as license to feel okay about watching this mammoth movie in two sittings. Whilst Der große Spieler and Inferno are most certainly two parts of one story, there are also distinctions between them. 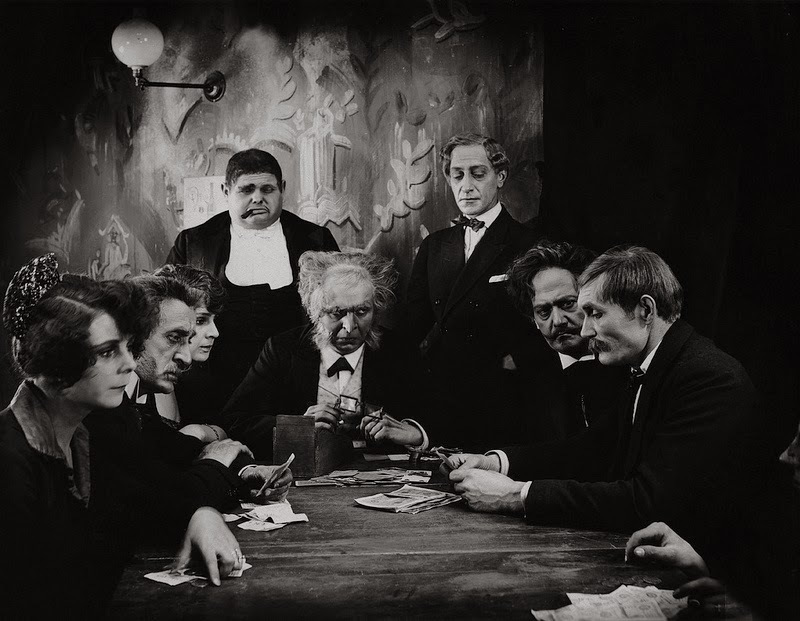 After a pacy and engaging opening act involving Dr. Mabuse’s (Rudolf Klein-Rogge) inaugural dastardly scheme of making a fortune by manipulating the stock market, Der große Spieler soon becomes less urgently paced. Mabuse’s career criminality in the world of gambling, aided by his abilities of both hypnosis and mind control, is introduced in the second act, with his main adversary Chief Inspector Norbert von Wenk (Bernhard Goetzke) entering proceedings soon after. Lang allows the final three acts of the first part to slow even further. The director’s focus shifts more and more onto sociopolitical commentary on the Weimar Republic and the indulgence and empty thrill-seeking of many during the 1920s, be it through gambling, cocaine or extravagant possessions. “What is your attitude toward Expressionism, Doctor?”, Mabuse is asked whilst attending an event at the home of Count Told (Alfred Abel). "A mere pastime”, Mabuse replies, “but then again, everything today is pastime.” Lang’s viewpoint resonates; it’s a shame that the director can’t quite reign his film in, instead allowing the narrative to become murky amidst his critical agenda. An attempt to neutralise Wenk resulting in a car chase - and the Inspector ending up adrift at sea in a rowing boat - should inject some excitement, but Lang’s execution is again muddled. Whilst it ends on an effective cliffhanger, the final acts of Der große Spieler leaves Dr. Mabuse, Der Spieler at arguably its weakest point. Thankfully, matters improve consistently throughout Inferno. The notably shorter run time of part two compared to part one helps, the director largely setting aside his sociopolitical message to refocus on making a compelling and well-paced film that concludes Mabuse’s story in spectacular fashion. It’s fascinating, however, to see (with the benefit of hindsight) Mabuse’s rise and fall in Inferno often mirror that of another power-mad sociopath who would mesmerise many Germans in the succeeding decade, displaying either incredible foresight or incredible aptitude for coincidence on Lang’s part. The script builds the tension expertly as Wenk and Mabuse’s cat-and-mouse game gets ever more compelling. Lang also employs some truly impressive visual effects throughout Inferno, which must have astounded 1920s audiences and are still seriously powerful now. The hallucinations of a hypnotically disturbed Count Told are both impressive and chilling; Mabuse’s theatrical hypnotism show performed as “Sandor Weltemann”, whilst a key plot device, is also an excuse for Lang to show off some of his most elaborate effects. By the time Inferno reaches its final act, you’ll be truly engrossed in how the nefarious doctor’s tale will conclude. With allusions during the finale to another machiavellian villain - Shakespeare’s Richard III - Lang successfully elevates Mabuse to one of cinema’s most memorable anti-heroes. Whilst both parts have individual highs and lows, there are also strengths and weaknesses that run throughout Dr. Mabuse, Der Spieler as a whole. The sets are often lavish and intricate, making Lang’s picture regularly an attractive experience to take in. Rudolf Klein-Rogge as the titular doctor is also enthralling, with unforgettable facial expressions and eyes whose implacable stare will be permanently etched into your memory. “You gamble with money, with people, with destinies… and, most harrowingly, with yourself”, Mabuse is told at one point, and thanks to Klein-Rogge’s performance you believe it absolutely. The actor’s skill in carrying off Mabuse’s ability as a “master of disguise” is also impressive, selling each of the doctor’s many aliases believably and entertainingly. Problems come from some of the more antiquated elements of the film, with the intertitles frequently cumbersome and overbearing. They also cause problems for the contemporary English subtitles: I regularly found myself pausing the film to decipher English translations displayed on top of the original German print on an overcrowded intertitle. It’s something of a catch-22 issue, as making sure the subtitles and intertitles do not clash would involve presenting the film in an altered form, which surely would have caused equal if not greater ire in many. By the time you reach the final scenes of Dr. Mabuse, Der Spieler, it’s almost impossible not to have come under Lang’s own cinematically hypnotic influence. It’s not a perfect film, nor will it give up its charms easily. 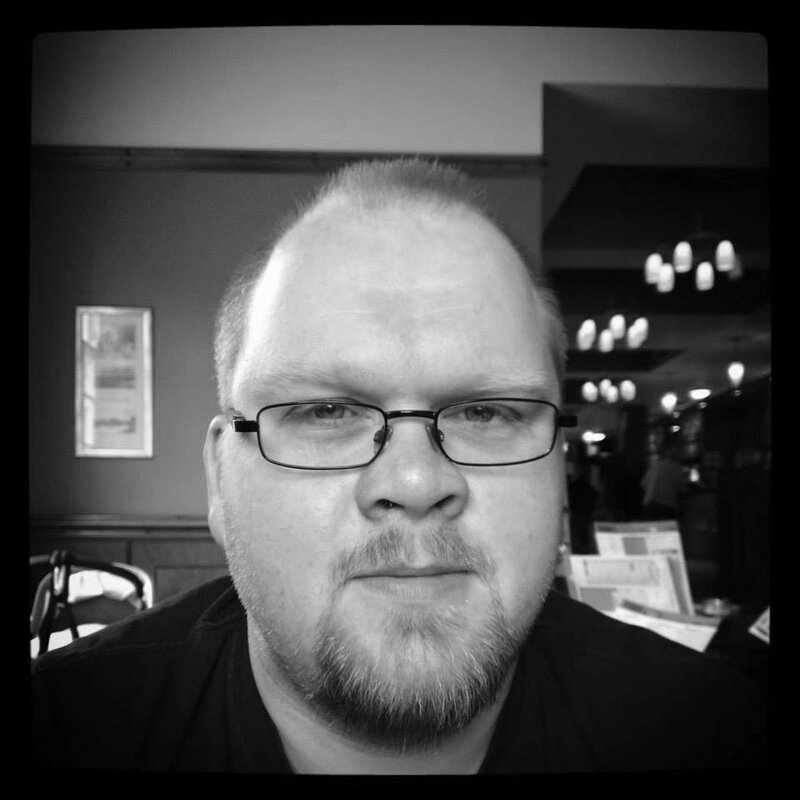 But stick with Lang’s film, past the bloated and at times tedious elements found in part one, and it will reward your determination with a powerful and often finely crafted cinematic experience, the like of which neither could nor would be made today.